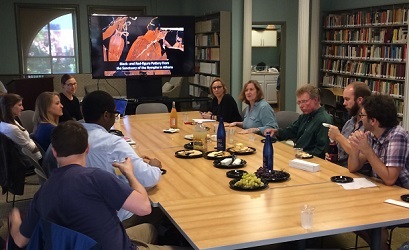 Archaeology Brown-Bag Workshops provide an informal, interdisciplinary venue for presentations of work in progress by students, faculty, and visiting scholars, and for discussion of developments in the recent archaeological literature. Light refreshments are served. Workshops convene more-or-less tri-weekly on Fridays at 4:00-5:30 in the conference room on the second floor of Brooks Hall, unless otherwise noted below. Organizational Meeting to welcome the new members of our community, introduce ourselves and our areas of interest, and discuss potential Brown Bags for the year. “Little necessaries or comforts”: Enslaved Laborers’ Access to Markets in the Anglophone Caribbean. Lynsey Bates, Digital Archaeological Archive of Comparative Slavery, Monticello.